EDM artist Marshmello staged a special show in Fortnite’s Pleasant Park today, playing a short set for players who showed up for a round of Battle Royale. The show featured several songs by Marshmello, some lovely lighting, and a few suspensions of the laws of gravity. 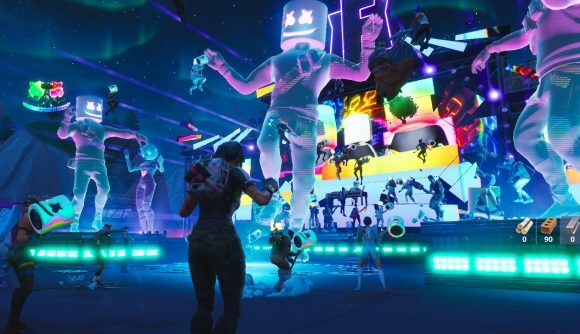 Players who jumped into Battle Royale at 14:00 ET Saturday got to see Marshmello perform ‘live’ on a special stage set up in Pleasant Park. Respawning was enabled, so everyone got to see the full performance, which featured Everyday (with fellow performer Logic) and his hit Happier. Giant holograms of Marshmello joined in on the dance floor, and at ‘Mello’s word, showgoers were suddenly bouncing around the area, leaping over rooftops and above the stage. When the beat dropped on Marshmello’s Fly, everyone present suddenly found themselves literally flying, suspended in the air as if they had just jumped out of the battle bus. They swooped around the stage and through the beams of light projected across the square. It was, without any intention of a pun, a surprisingly uplifting experience. If you missed it, here’s a video of the whole show. Marshmello teamed up with Epic Games on the event, with posters advertising the concert scattered around the island and incorporated into the latest round of Fortnite Showtime challenges. Attendees received a ‘Keep it Mello’ emote and ten balloons to use as consumables – you could activate as many as you liked in order to float across the landscape, and then release them when you wanted to. While it wasn’t quite like being at a real concert, Mashmello’s quick Saturday set in Pleasant Park was a more-than-welcome dose of raw positivity.